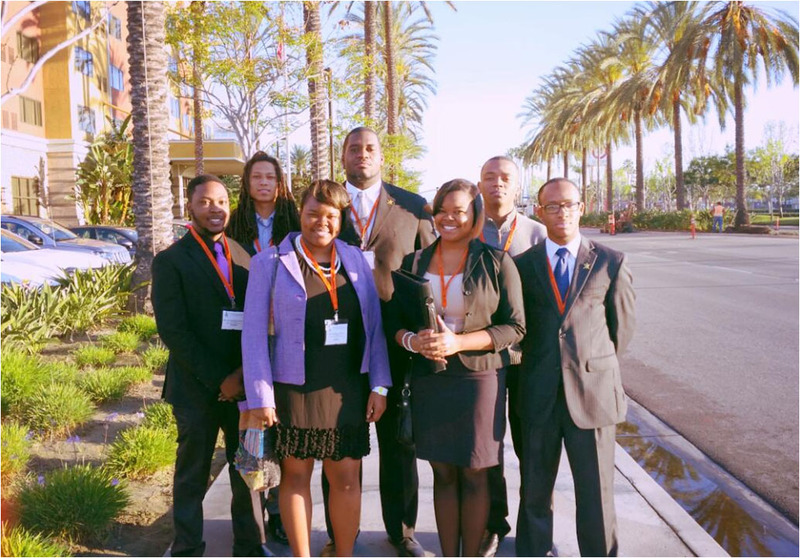 April 2, 2015 –Nine students from the’ Fort Valley State University’s Society of Black Engineers (FVSBE) attended the 41st Annual National Society of Black Engineers (NSBE) National Convention in Anaheim, Calif. from March 25- 29. Members mingled with NSBE chapter members from around the world and learned more about the convention’s sponsoring company United Technologies. Later, the FVSU students enjoyed the Well-Spoken Comedy Show, featuring real engineers doing stand up comedy about their workplaces. The engineers also shared valuable advice about being African-Americans working in corporate America. “Many of the FVSBE members laughed so hard that they had sore throats the next morning,” said Ashley Davis, NBSE’s president. On March 26, the chapter attended the Region III morning meeting, where they dominated the chapter chant competition. At the event, Tiffany Sitherpong, the Regional Chair, gave the State of the Region address and met the candidates for the 2015-2016 Region III Executive Board. FVSBE chapter senators, Shanice White and Quedarrian White, sat in on the Regional Executive Board candidate speeches and were given an opportunity to ask the candidates questions and vote for the candidates they believed were the best for the positions. Later in the day, the members attended a career fair where thousands of graduate schools and companies, such as Boeing, Chevron, Microsoft and Google, were present. Shanice White received an interview with the Southern Company and an exclusive invitation to the company’s hospitality Suite. Sheriece White received an interview with INROADS and discovered that Chevron Oil Company was interested in her interning with the company in the summer of 2016. The fun continued on March 27. Four of the FVSBE members were honored for their academic achievement at the APEX and Graduating Seniors reception. “Being named a NSBE APEX member is one of the highest academic honors the organization can bestow on an undergraduate member,” Davis said. FVSBE members Jaylan Dawson, Sheriece White and Shaince White were named APEX members and Ashley Davis was named an APEX Honors member. Davis was also recognized for her work with the NSBE Leadership Fellows. The chapter was also recognized for their work with the NSBE Retention Program. After the morning meetings and workshops, the group and the chapter’s co-advisor, Robert Stephens, FVSU director of Development, went to Roscoe’s House of Chicken and Waffles, Anaheim’s popular Joe’s Italian Ice and Ice Cream, and Disneyland. On March 28, the chapter attended the 18th Annual NSBE Golden Torch Awards hosted by actor Laz Alanso. Afterward, the group wrapped up the conference by having a group dinner at Red Lobster where Shanice White received news that Southern Company was offering her an internship position for the summer. “It was a great way to end a great conference,” Davis said.